Fremont, CA – June 22, 2011 – Jason McDonald, Ph.D., a leading SEO / Social Media consultant in the San Francisco Bay Area, is proud to announce his latest SEO project with California Pacific Medical Center (CPMC): SEO revisions to the Skin Cancer / Melanoma microsite. California Pacific Medical Center is one of the largest private, not-for-profit, academic medical centers in California and is a Sutter Health affiliate. As a tertiary referral center, the Medical Center provides a wide variety of services, including acute, post-acute and outpatient hospital care; home care and hospice services; preventive and complementary care and health education. "As we all know, the United States is experiencing a increase in skin cancers and melanoma," explained Dr. McDonald. "CPMC is one of the top cancer facilities in San Francisco, and I was really honored and excited to work with CPMC on this project to help promote their doctors and services to the citizens of not just San Francisco but the entire San Francisco Bay Area." The revised Skin Cancer / Melanoma Center microsite includes information on their top San Francisco-based skin cancer / melanoma specialists, treatment options, and conditions concerning skin cancer / melanoma. Blanchard makes some great points throughout the book, beginning with the title. Even if measurement of ROI is difficult, that’s no excuse not to set up basic measurements for a Social Media Marketing campaign. Before / after is an obvious split – do we have more Twitter followers today, or more tomorrow after we honestly and eagerly create a Twitter marketing plan? I eagerly awaited the UPS man with her delivery of a book claiming to help us measure the Return on Investment of Social Media Marketing. I wondered, would the measurement by an increase in Twitter followers, Facebook likes, LinkedIn connections, YouTube views, or perhaps the Holy Grail of marketing – actual conversions to a sales action, like purchasing our product? Many are engaged in Social Media Marketing, I thought, but few are engaged in the actual measurement of their Social Media Marketing ROI. Blanchard makes some great points throughout the book, beginning with the title. Even if measurement of ROI is difficult, that’s no excuse not to set up basic measurements for a Social Media Marketing campaign. Before / after is an obvious split – do we have more Twitter followers today, or more tomorrow after we honestly and eagerly create a Twitter marketing plan? URL click thru’s is another – if we Tweet a URL, blog it, post it to our Facebook page – do people actually click thru. Bit.ly is a great free service for quick URL tracking. And, finally, if our ultimate goal is to sell something or drive registrations for a free consultation, webinar, or download – is our Social Media Marketing driving those conversions? Blanchard touches on all these topics, but doesn’t provide a great framework for setting up measurement. Ultimately, the book – despite its title – isn’t really about ROI. It’s more about weaving Social Media Marketing into your organization. That’s really pre-ROI, if you think about it. And that, dear reader, brings us to the year of our Ford. In Huxley’s famous dystopian novel, Brave New World, the future society is organized around principles of mass production, modeled very much after Henry Ford and the factory metaphor. Ford is so worshiped in the future society, that people speak of “our Ford” much as people today speak of “our Lord” or say “Jesus” when they just missed a close call in an automobile. Blanchard, like so many in Social Media Marketing, worships at the feet of our Ford. Many of his examples connections, reviews come from major companies – companies such as Ford. For example, on page 23, Blanchard discusses the head of Ford’s Social Media strategy (Scott Monty) and how Ford reacted to the negative PR about the auto industry bail-out’s. Ford wasn’t a recipient, yet its brand was damaged, so Monty went into social media overdrive to address brand damage during the financial crisis. Is this important? Yes? Is it relevant to a small business? Not so much. Few of us have a brand as big and powerful as Ford, and few of us are ever even close to receiving Tarp money. Why is this relevant? The issue is that the examples drawn in this book, plus in many others, draw on high profile names and brands (names and brands that help authors sell books, give books credibility by name-dropping…) but ultimately are not very relevant to small businesses. Small businesses need social media advice on issues such as how to respond to a negative review on Yelp, how to get to the page 1 of a Google search using Google Places, how to get your products into Google Merchant Center, or the tricks and tips to success of review marketing on Amazon.com. In this, the book disappoints because it worships at the feet of our Ford. Furthermore, much of the book is really addressed to large companies, with large teams, and large brand issues. Many chapters read at a very high level, executive discussion – when most small businesses need hands-on, direct advice on how to implement social media marketing. Is this bad? Not particularly. But if you are a small business struggling with social media marketing, much of this book is clearly not written for you. It’s written for executives at multinational corporations such as Ford, not the mom-and-pop watch shop in New York City that needs to encourage Yelp reviews. Maintain a list of everything you can measure. Maintain a list of everything you must measure. Test, measure, learn, adapt, repeat. The final measurement chapters have great food-for-thought examples, such as connecting changes in sales performance with social media mentions. 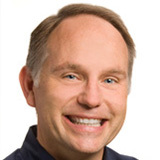 They lack a clear list of tools for measurement (especially free social media marketing tools), as well as a clear “to do” list that connects abstract concepts to practical measurement. 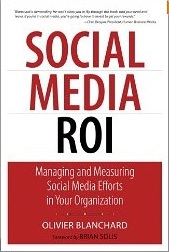 That said, the ROI discussion is one of the first I have seen in a book, and therefore this book will stay on my Social Media Marketing bookshelf – as a remember to a) not worship at the feet of Ford, and b) measure everything!